The history of European integration has been characterized by several “stops-and-goes” with considerable support on political grounds. 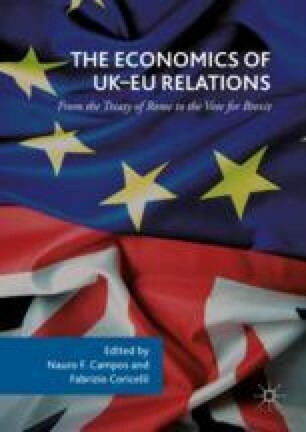 In this chapter, we discuss the role of European integration for the future of the EU–UK relations. Integration, consistent with the idea of “completing” the European Monetary Union (hence, a “Genuine Economic and Monetary Union”—GEMU), will have the obvious consequence of affecting the UK as well and the future of its negotiations with the EU. Provided that European integration worked in the past, the net benefits of staying out of the EU ex ante may be different from the same benefits ex post, particularly in the likely scenario the Union will have to “comprehensively” move towards a GEMU to safeguard its integrity. Campos, N., Macchiarelli, C. (2016a, March 03). Brexit, ‘euro-ins’, and ‘euro-outs’. VoxEU.org. Chartered Institute of Personnel and Development. (2015, January). Employment regulation and the labour market. Policy Report. Available at https://www.cipd.co.uk/Images/employment-regulation-and-the-labour-market_2015_tcm18-10238.pdf. Rodrik‚ D. (2007). The inescapable trilemma of the World Economy. http://rodrik.typepad.com/dani_rodriks_weblog/2007/06/the-inescapable.html.